What about Muslims? How can Muslims live? How will Muslims be treated? Muslims will be discriminated against! Muslims will be alienated! That Yogi’s Matt in Gorakhpur caters to Muslims too. That Yogi allows Muslims freely in the temple and some work there too. That Muslims celebrated Yogi’s appointment as CM. That Yogi’s first engineer was some Muslim called Nissar. And then many of these Hindu guys RT any Muslim who claims to have benefited in the past from Yogi’s deeds and compassion for Muslims. All of this is harmless but, seriously, what is the need for excessive defence? Some good examples are enough but why go on and on telling stories of how Yogi cares for Muslims? Is a state or this country going to be run solely on what Muslims are or want? Is a state or this country going to define politics and society by one community? Is everyone else nothing but worthless pieces of junk? Think for a minute. Do Hindus stand by Yogi because he does good for Muslims or because he is a staunch Hindu and not a rabid Sickular? I believe it’s the latter so we don’t need to lecture morons on what good he has done for Muslims. We don’t need the approval of Muslims or their apologists in media and politics. Hindu leaders have repeatedly demonstrated they can stand and work for everyone. I cannot say the same of others. Don’t ask what will happen to Muslims under a Hindu leader or a Mahant. Ask what will happen to Hindus under a Muslim leader or a Mullah. This Pappu and his treacherous father who live their miserable lives on Indian money, abuse India all the time and want Kashmir separation from India makes this dumb statement. And what is the reality? 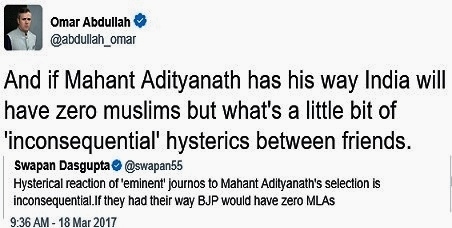 It is Muslims like Omar and his dad who have overseen the complete elimination of Hindus from Kashmir. That’s why ask – What will happen to Hindus if a Muslim leader or Mullah becomes the CM. As with Kashmir and also in Bengal and Kerala (Where CMs are Commies and Muslim appeasers)? Hindus will be wiped out sooner or later. On the day the slaughtering of Hindus began in Kashmir, coward Farooq Abdullah ran away to London with family. And these scumbags speak for any community? Reject such filth and assert yourself. No need to show Hindus are kind to Muslims – that is not a debate that is necessary because the facts speak for themselves. Let us now ask how Muslim leaders show kindness to Hindus. And they can start with Ayodhya. But even on that they will demure when they know the truth – Babri was built on a destroyed Ram temple as were many other Mosques. Truth is, Muslims are far safer under a Hindu leader than Hindus are under a Muslim or Chrislamist leader. Kashmir is a good example. 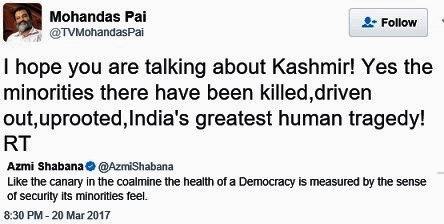 But you also have Bengal where Hindus are being killed. Hindu temples and culture are being brazenly destroyed. What about the Commie Pigs of Kerala? The less said the better. And the guttermouth Owaisi who the media grandly touts as a Muslim leader? Make him CM for a month, I guarantee he and his brother will wipe out Hindus in 15 minutes. Oh wait! Asadu’s moronic brother already made that demand. He still runs free and the Commies in media and politics wonder who holds a threat to society. Whether Gujarat or Maharashtra, Muslims haven’t faced any discrimination. And when it comes to communal riots, remember, there have been 400+ riots under the Akhilesh govt in UP. All have of these have been washed and laundered by Commies in the media and politics. We don’t ask why Hindu-haters in Bengal or Kerala are CMs. Why should Muslims or anyone else ask why a saffron-clad CM needs any explanation. He is the choice of the people and his party – He and the public don’t need approval of Muslims to run his govt in UP or anywhere else. Those who have a problem are welcome to seek their Tunday Kabab elsewhere in the world. India is a Hindu majority country and naturally will mostly have strong Hindu leaders. This is a reality media and Commies can either accept or become a hero like Vemula. Either way, Hindus and Hindu leaders do not need any Muslim approval for their politics, governance or agenda. This post is hardly perfect. What is the Hindu Agenda ? No appeasement of Muslims and others. That is already well established. Not a single Muslim ticket was issued in UP election. What is the point of constantly talking about Rajdeep, Bharkha, Sagarika, Abdullah and few other baiters who are well known losers and people already don't care much about them. Why give them this much importance ? Instead attack the voices that are damaging in a more subtle and well organized way. I don't know if it is Tilak or Savakrkar. Said to Muslim leaders and Muslims as regards freedom struggle. We will have our freedom if you come with us we will take you along. If you don't come then also we will go ahead. If you oppose in-spite of you we will have our freedom. I think Modi is following this rule. Development doesn't mean you have to forsake your identity. Another point. 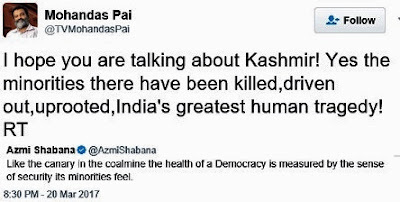 If Muslims will be annihilated as expressed by this Moron Farookh Abdullah Marathas and Peshwas ruled most of the India in the 16 th and 17th century who are as per present standards are fanatic hindus then we should have no Muslim by the beginning of 19th century. As you said his scare is natural because a Muslim leader like him will do the same to minorities. Like a Ash pumpkin thief who will dust the ash from his body. Unknown, that is what you people are trying to do world-wide.. But the problem is that non-Mulsims won't give up without a fight. Remember how Shivaji killed Afzal Khan. Australian PM said to Muslims of his country if you want Sharia go t any other country that gives your sharia. Australia will have one law i.e their constitution and theirs isa christian country. God bless you Ravinar, keep fighting, you are the warrior of our times! If only you could write the history textbooks, slavish traits of past few centuries might get an antidote. A vast majority of Hindus and a big chunk of Muslim women have voted for the BJP and the fulfillment of their expectations and aspirations is the top priority of the UP CM and ignore the anti BJP cacophony. I don't think so. Mayawati inspite of her poor show still got 20% of her vote same as last time which proves muslims and dalits voted as before.Muslims will vote anybody who are against BJP and will probably continue. Bro you've outdone yourself. So aptly argued. I was beginning to wonder why the RW were acting so stupid by going on and on about YA's Muslim fans. You've hit the nail on the head!! 80pc of Indians are Non Muslims....why do we need to always appease them??? Cannot we have one rule for all citizens...Does Pakistan create their hindu population likewise? NO...Hindus are asked to adjust their way of life as per the common law in Pakistan then why should India crumble to this minority politics....just for votes??? Leftist and secularist always go hand in hand for modern islamic invasion.... You summerized it correctly from modern indian civilization prospective. Excellent, hard hitting article...What Muslims are? They are showing their true colours all over the world, by cutting the hand that feeds them and this moron Omar teaches us about tolerance..instead of telling his brothers elsewhere.. Pitch perfect! !We don't need to be defensive .Be assertive. The commie media has become irrelevant so also Chinese seckilurs. Frustration of shop closure of supari journalists is a key issue. There is no one to butter their bread to breed hatred. Absolutely no nonsense write up summarising the current politics of commies and sickulars aided by Lutyens mafia who have lost their easy money and cult status due to Modi and now reduced to a ranting machine. You have given very lucid expression to our thoughts. Couldn't agree more. The apologetic Hindu needs to mend his mindset and start taking control. Timely lessons. It will be interesting to see the statistics 1) So far in India's history what's the proportion of time Muslims have occupied the positions of President and Vice President in relation to their population. And 2) what is the proportion of Muslims in our armed forces, and 3) what's the proportion of Muslims who participate in national functions like Independence Day and Republic Day out of their own feeling of nationhood. Perfect!🙏, a mandate by the people for getting rid of leeches, a man wearing his belief on his sleeve now being hounded by the most rotten of Indian society the MSM. And why should the largest chunk of a religious group following medieval evil, Grovelling in dirt, abject poverty , mollycoddled by the selfish Gandhis Yadavs and what have you get preferential treatment? Why only Hindus always either have to get slaughtered or be apologetic? Makes you wonder! Muslims are no special community and at 18-20 crores in India they don’t even qualify to be a minority anymore.Parsis community which constitute approx. 5k that to in Maharashtra but never asked for minority status.They are happy & proud to be Indians. Sir Great and timely post. Respects. Fully agree there is no need to justify AY's selection. The majority decides what is good. If there are dumbos wanting a special treatment they are welcome to go elsewhere & get it. There cannot be dual standards and appeasement of the so called minority ( though actually the second largest majority). Do not be apologetic. This is it Take it or leave it. That should be the stance.Hope this starts the process of uniting the Hindus for their own good. 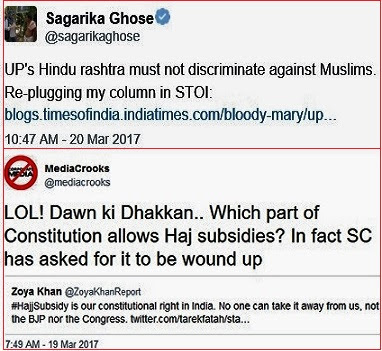 More than UP Muslim's it appears that the presstitutes and those who are outside UP are more upset at the turn of events. Let all of them write like they are doing right now. Yogi will surprise the. It means more egg on their faces.And namo is like BALI..whoever fights with him upfront will loose half of their power to him.In UP all those fought with him lost almost everything. And since Sriram is with him no one to send arrow from hiding. Especially advice in last couple of lines is climax of this write-up. Hats off to you and thank you Ravinar for consistently being our Voice. Very appealing article.. India is catching up the truth slowly but surely. 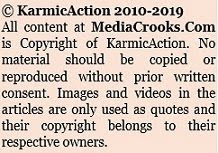 Your contribution is immense @mediacrooks. By the way request to unblock my twitter account : @newsanti. I don't know why u blocked me. Anyways I am too a foot soldier towards service of Our Bharat Mata. It's time for our PM to stop blathering and start acting on his electoral promises to Hindus. Don't let him forget it. All this debate is Tamasha if Modi cannot deliver on his promises to us Hindus. You begged for votes claiming you didn't have votes in Rajya Sabha...the Hindus gave you votes. You begged foreign governments for money since You claimed Indians didn't have enough money...the NRI's poured in money. You begged Hindus to wait since you claimed Ram JanmaBhumi is a legal problem even though it is not...the Hindus waited patiently for 3 years. But instead, You gave us things we didn't ask for. You gave us GST. We politely accepted. You gave us Demonetization. We grinned and bore it. But now you have exceeded even our legendary Patience. With the recent wins in UP and other states, you have got all three you begged for (see above). So Don't shirk your duties anymore looking forward to more and more Votes. Don't go against the teachings of the Gita on which you have sworn to do your Duty to Bharatamata. Bharatamata is bleeding today due to Desh Drohis who are running unfettered. Don't be a Coward that dies every day since he is afraid of what people will say or think in the Media. Crush your enemies. You are running out of excuses and your begging bowl act is getting tiresome. Don't fool the world that you are a Hindu Hrday Samrat While being a cowardly Coolie in the great tradition of all Indian Coolie PM's beholden to Foreign Interests. INDIA IS THE ONLY NATION ON THE PLANET WHERE INDIAN BANKS REGULARLY GIVE LOANS TO TERRORISTS TO BLEED BHARATMATA. It's a pity that you and your Falthu Cabinet does Not know how they do it in order to stop it. As Trump has shown the world, balls of steel are required to crush Internal Drohis. Remember: you can forgive an Enemy. But you can never Forgive a Traitor. You are still bowing to Indian Traitors like Vineet Jain and Prannoy Roy. We seriously doubt you have balls of steel. Trump banned CNN the minute they broke their vows to be impartial. Do the same to NDTV and ToI. Use your powers as PM. Do not be afraid. Stand up for once for Bharatamata and HINDUS !!! We warn you. Your legacy lies in the Hands of Hindus. Not Muslims and Christians who always hated you. Don't turn us Mighty Tolerant Hindus into Intolerant Hindus. Once that happens, The world is not big enough to contain the Hindus' Anger. Beware! opposition and MSM presstitutes. Are you the sole representative/benefacor of all those goodies. Can you please bestow him room to maneuver or do you want to be as unreasonable as media, press, opposition, and minorities. For godssake let us also not be contributors to the pressure and turmoil for the most unselfish and capable human we got in our lifetime and for generations. True! Hindus shouldn't b taken for granted. Be proactive now Modiji!! विकास तो होना ही है,देशद्रोहियों का पारिपत्य करें,अटल-बिटल या नहरू-बिहरू न बनें! The fact is that Modi's entire cabinet of Chamchas and Yes-Men are girly-men with deep ties to foreign interests. They are more loyal to Sonia than to the Watan. And Modi keeps making all the right Noises to keep the Hindu masses entertained while the actual Cabinet is completely and totally Incompetent. Modi: Fire a few Ministers. Start acting like a PM instead of like Alice in Wonderland. Listen to the people. Don't lecture them. We want Hrday Samrat Ministers. Not Chamchas and Girly Men like Venkaiah Naidu to praise you endlessly with Faalthu Idolation. Yogi Adityanath clearly stated in a Aap ki Adalat prog if the majority are secure automatically become secure. Think that reflects in your blog. BJP leaders must stop attending fake debates of English MSM defending BJP's Govts. Let these bogus media keep an empty chair for BJP in their useless debates. As most of us were unhappy that Modi was not addressing the social issues, he just gave us a answer by choosing Yogi as UP CM. After surgical strike and demonetization choosing Yogi as UP CM is the biggest strike Modi gave to sickulars. "Don’t ask what will happen to Muslims under a Hindu leader or a Mahant. Ask what will happen to Hindus under a Muslim leader or a Mullah." The media seems to be under notion that Hindus cannot rule properly unless they assuage the minority community. By continuous supporting the minority, ignoring the majority, the sickulars were ruling very good & it is the best form of democracy as per the media & they are continuing to hold their ideological positions. Sweet, Sugary & Sweaty Ghoose is surprised that election of Yogi Adityanath as CM - what message is being sent to minority community. She forgot that post partition, muslim minority still have chance to migrate to Pakistan & India will bear all transport expenses & Hindus will contribute to it, if government of India falls short of revenue allocation. She can also join the minority migration to Pakistan & Pakistan will reserve a bungalow in Karachi next to Dawood Ibrahim to continue her anti-Hindu, anti-modi speeches to be an assistant to Mullah Hafiz Mohd Saeed. Crow can change colors with Swan, but not this Sweet, Sugary & Sweaty Ghoose. The next five years will prove beyond doubt that minority have prospered under Hindu govt & there is no doubt that minority cannot rule over majority. Those days are gone. While Hindu's never dictated things to Indian minority muslims, Indian muslims should their mind set, for their own good & become liberal in their views for the good of the country. Nation should come first than religion. Narrow interpretations of religion are so entrenched that it should be uprooted from its mental soil. Excellent delivery right up to the Nose of the anti nationals,morons and pigerals. 1) First of all why India Today should go to a Muslim University if not with bad intention because India Today wants communal issues to flare up. The paid media wants to poke every one's nose. 2) A similar exercise at BHU or any other university! if not why? 3) Aligarh muslim university campus thinking is not the same as ground report. 5) This Muslim University should be dismantled & buildings to be demolished & fresh buildings to be built, so that there is NO left over scars of history. This muslim university needs to be cremated & burried for it raises the stink of Pakistan in modern India. While agreeing fully with you I wish to add that while not only media always goes to such places and varsities to generate and highlight dissent they also seek and isolate the persons/groups conducive to their agenda. Agenda driven politicians may be acceptable, but definitely not the Media. Just like NDTV and Ravish , when are we going to inject poison to India today , they are very cleaver in changing sides, Their journos never leave any stone unturned to lay down safron in TV debates. Clealry visible by Anjna On Kashyap, really a terrible lady and full with likes of BD,SG,RA along with others. CPM in Kerala is essentially a Hindu party. Their 80% supporters are Hindus. CPM is not anti-Hindu in Kerala, like Mamata in Bengal. In Kerala, the fight is between Hindus in CPM and Hindus in BJP. 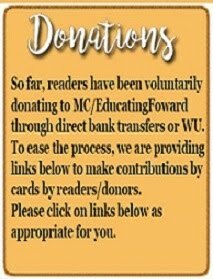 Mulsims rarely come in this issue. Modi and Yogi threaten that core status quo which presents an existential crisis to pretty much every political party in India hence the over-the-top reactions. There is a cabal (media, institutions, etc.) that feeds from maintaining the status quo on these principles. 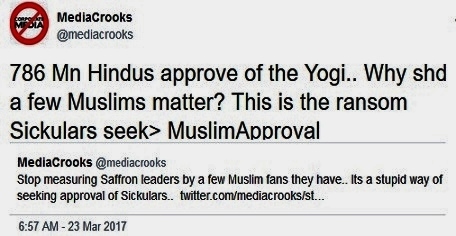 MediaCrooks / Ravinar has taken the lead to turn the tide of appeasement which is harmful to society and individuals alike. Amit Shah didn't want 2019 to go 2004 way and lose General Election thats the one and only reason for Yogi as CM of UP. If it is true that Muslims have voted for BJP then they have played there game by rule book. Means they have tied BJP's hand. Very timely warning to leaders who have been elected by Hindu votes.Crooks in the media as well as every leader worth his/her vote share was talking about Muslim vote and how it will work to defeat a BJP candidate in each of the 403 assembly constituencies in UP.Now that Hindus have given them 325 seats why worry about Muslims? If you have promised that ILLEGAL slaughter houses will be closed down - pl do.If you have promised police squads against love jihad - pl do.If you have promised highly improved law and order situation - pl do.Learn to ignore the dogs that will keep barking in any case. Fantastic . This is my view as well. Whatever has been promised by BJP in Jan Sankalp Patra to residents of uttar pradesh, It must be implemented fully asap. If Muslims want a Muslim leader, they can happily go to Pakistan or any other Muslim country. India is NOT for Muslims alone. We Hindu Nationalists need to ponder upon a very immenent & creeping danger. Nitish is is threatening Laloo that he might cross over to NDA & threby pushing all sikular parties to back him as main contender to Modi in 2019 all the while keeping BJP guessing for his support. He is playing his cards very smartly. Gurudev Mera Sadar Pranam v CharanaSparsha Sweekar Kijiye!!! It may not be appropriate to compare your articles with Lectures of the Sh. S Guruurthy related to Mother India , but I am sure there is a lot common. I also read pgurus.com and NDTV frauds is common in now a days. All this among others is clear indication that Hindutva is on right path and Bharat Varsha will be Vishguru in days to come. We will atttain Param Vaibhav . The main ? is these commies and anti nationals have thick skin, they also could not understand any other language than physically handling them with Dand (RSS) and what not. We must start a final offensive from all quarters to get defeated them , let us stand and set an example that hence forth only say of majority will work ahich is essitial part of our Sanatan Dharm. According to sickular media Modi & Amit Shah cheated the UP population by NOT telling them in advance that a staunch Hindu person will be the Chief Minister if BJP is voted to power. Stories & phrases are built around this "cheating" logic. Now Hindus or Indian can also apply & stretch "cheating" principle that by electing Nehru as PM, India did not expect Khangress will become a dynastic party !!! Further they are thrusting hindus to accept Pappu as the Prime Minister of India !!! 4) The karma philosophy clearly states that self effort / hardwork & determination of an individual should be given due merit than claiming a birth right of being poor family. 9) Improve surroundings of all temples (big or small) & make a pleasant place for all age group to flock to temples again !!! & that place can be a place of healthy discussions in presence of god.